The CBC test panel checks the complete blood count with differential and platelets. What is a CBC test? The CBC blood test, or complete blood count test, with differential measures various markers, including the WBC, RBC, hemoglobin, hematocrit, MCV, MCH, RDW, and platelet blood levels. Why is the CBC blood test important? 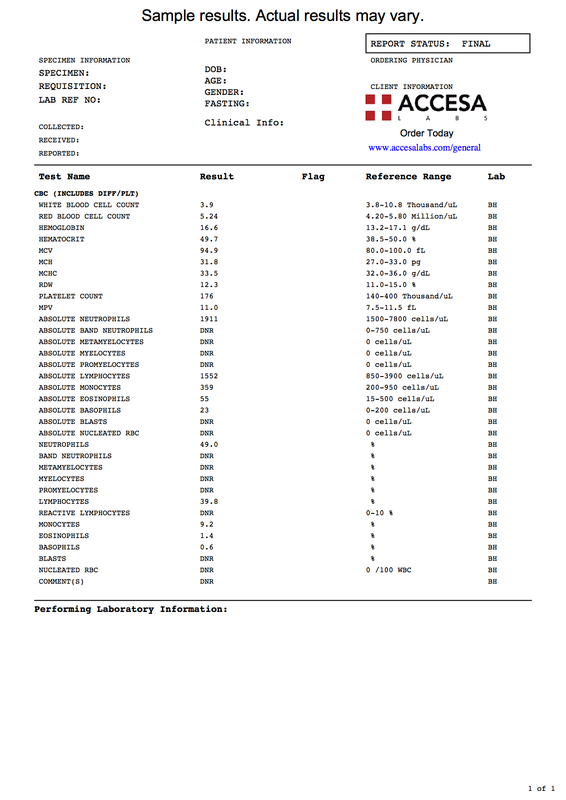 This CBC test with differential helps check for anemia, assess the immune system, and screen for specific clotting disorders. This CBC Test is a blood test. This CBC test, also known as a complete blood count test, CBC test with differential and platelets, and CBC lab test panel, measures the levels of various types of cells and proteins in the blood. The CBC test with differential has been used for decades and is easily performed using standard laboratory equipment. The main focus of the CBC blood test is to evaluate the presence and quantity of several major types of blood cells - platelets, red blood cells (RBC), and white blood cells (WBC). In addition to measuring the quantities or concentrations of the different major types of cells in aggregate, the "differential" part of the complete blood count analyzes subcategories of the major categories for a more detailed picture of one's blood count. White blood cells can be divided into the subcategories neutrophils, lymphocytes, monocytes, eosinophils and basophils. Cell counts for these different types of cells are often elevated in bacterial infections (neutrophils, monocytes), viral infections (lymphocytes), allergies and parasitic infections (eosinophils) and specific types of cancers (lymphocytes and basophils). One component of the red blood cell counts is the hemoglobin test and, with the hematocrit, is often used to check for anemia. Platelets are an important part of the clotting system and the concentration of these cells are measured in the CBC test. The CBC test, along with the CMP test and the lipid panel test, are considered important lab tests for routine wellness screening. Some people interested in the CBC test and these additional laboratory tests order the Wellness Panel 1 for a more detailed wellness evaluation. Some lesser utilized components in the CBC also can be useful in certain situations. The mean corpuscular hemoglobin (MCH) represents the average amount of hemoglobin inside of an RBC. High MCH levels are seen in macrocytic anemia that might occur when someone has a deficiency of vitamins B9 or B12. Low MCH levels might be caused by microcytic anemias, iron deficiency anemia, or blood loss. The mean corpuscular hemoglobin concentration (MCHC) is similar to the MCH but represents the average concentration, rather than the amount, of hemoglobin inside a red blood cell. The mean corpuscular volume (MCV) measures the average size of a red blood cell. The MCV is useful for classifying the broader category of anemia when it exists as microcytic (low MCV), normocytic (normal MCV) or macrocytic (high MCV). The red cell distribution width (RDW) helps assess variations in the size of red blood cells. RDW levels are sometimes used in conjunction with the MCV level to understand what might be causing an anemia. High RDW levels are sometimes seen in anemias caused by a deficiency of vitamins B9 and 12 as well as iron deficiency anemias. There are a number of reasons that people get the CBC test. Most commonly, the CBC is ordered as part of routine blood work performed quarterly or as part of an annual physical exam. In this capacity, the CBC test gives a helpful snapshot and is a useful adjunct to other health testing. The CBC lab test is also ordered in the setting of illness - both acute and chronic - as it plays an important role in identifying hematological changes associated with an infection, cancer, clotting disorders and other conditions. Checking for anemia is another common reason people get the CBC test as the hemoglobin and hematocrit levels are helpful in that regard. While an anemia test panel might be more suitable for an advanced anemia workup, the CBC blood test is useful as a first-line screening tool for anemia. Most people who obtain a CBC test can focus on a few key markers within the test results. With slight variations, CBC test results are typically normal in most healthy people. In the setting of infections (particularly more severe ones), the components of the CBC such as the white blood cell count start increasing and highlight that an acute process is going on in the body. CBC lab values also start to change when one has anemia (as seen by decreasing hemoglobin and hematocrit levels). Platelet level abnormalities can lead to blood clotting disorders. The rest of the CBC lab markers tend to be of greater interest with more complex and infrequent blood disorders and are usually evaluated and managed under the guidance of a hematology specialist. The process of getting a CBC test near you is a relatively simple one. Since the blood test can be performed by any standard lab location, getting tested just requires finding a convenient lab and getting your blood drawn. The blood will be drawn into a special vial that contains chemicals that prevent clotting and then the sample with be analyzed by a machine to determine results for the various CBC test components. The machine first mixes the blood specimen. Then, using a technique called flow cytometry, the CBC analyzer will use a laser to calculate the presence of different types of cells in the blood as they flow through a narrow channel. When considering CBC blood test results, both high number and low number of any given component typically imply an abnormality which, in the right context, can be concerning. For example, high white blood cell counts can signify an infection or specific types of cancers while low WBC counts can mean a compromised immune system. A high hemoglobin level might mean that you have a condition called polycythemia while low levels might imply a clotting problem related to a number of possible conditions. Given the complexity involved with interpreting CBC lab test results, we recommend that all CBC test reports be reviewed with a licensed medical provider. CBC Test at Guaranteed Prices.